So, let’s explore how good is the system and try and use that TB of traffic for testing using load testing by loader.io. First of all, let’s see how good is the connections to the server, just getting small file in request. I would like to see just NGINX performance, thus using SSL connection to skip the Varnish cache. Quite impressive number of requests handled, the duration of the test is 60sec, so it comes roughly to 9000 requests per second. Graphs are linear at first, but then hit some limitations. Graphs look a bit better as well, no dips in the middle, probably caused before by spawning of more PHP child processes, but possibly by some other processes on the server. These Network errors are not quite “Clear”, as I do not see much explanation as to what they are. 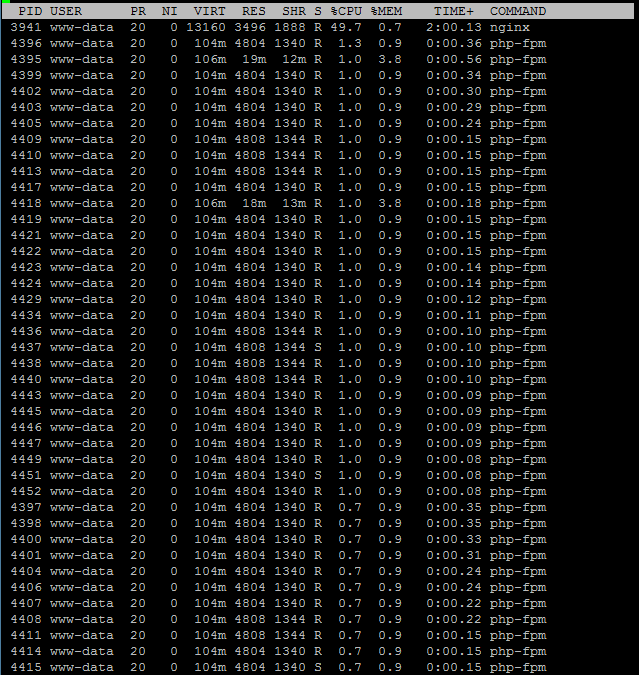 Supposedly these mean that mail server is not getting any messages, probably because the server load is high. Other than that – no indication as to what exactly is failing. Either way, it seems that will not be my main limiting factor anyway. Let’s try to to the same with a bit more content. Much more bandwidth, and better response times. Some network errors. CPU is not any more pinned to 99% with varnishd but floats around 87%, probably loading disk or just being limited by the bandwidth. Bandwidth graph is still limited at the same value (around 900 megabit/s), requests per second are twice lower. Times are more linear without jumps. NGINX alone handled 15% more requests, and got 10 times less errors – 47 instead of 405. Well, it looks like a bad idea. Just passing request from varnish to nginx increased the response time almost three times, and reduced the number of requests served by same factor. Now let’s make some basic PHP file, with basic output, producing small file. Basic echo statement will do for now. Ok, we see some 500 errors, a lot (100 times more) of “Network errors”. Let’s try to go other way, but keep one process. Adjusted worker_connections to 100 and kept the processes at 1. I’ve run couple more tests, and it appeared that some where between 250 and 300 connections per worker, errors switch from Network errors to 500s, so I set it to 256 for worker_connections and try to find out what kind of errors we are getting. TCP: Possible SYN flooding on port 80. Sending cookies. Check SNMP counters. After a bit more tweaking, it seems that 256 connections, without multiconnect, and 10 PHP processes seems to be best for this kind of “artificial test”. Now, let’s get real and try to serve some WordPress homepage. Obviously, it will not be as easy as the echo command and some parameters might need to be tweaked again. Let’s start with up tp 50 persistent users, with 500, it gets overwhelmed with errors too early to complete the test. It seems that all the “extra” requests get piles into queue, just making response slower, because more requests are piled earlier, with the same number of requests served over the same time, for my homepage that’s 408 per minute or 6.8 per second. Not using PHP 5.6 OpCache maxes out CPU with PHP processes and brings down maximum page loads to 116. Now let’s try to improve the performance, rather than make it worse. Let’s enable APCu cache and set W3 Total Cache to use it for Page cache, minify cache (manual, as auto minify seems to always fail), and object cache. Well, not bad result, actually, 74 times better than plain PHP with opcache. Just using APCu object_cache.php drop-in makes it even worse, bringing throughput to 191 page loads – that’s more than twice worse than without it. Now, let’s try xCache in the same Object cache role with W3TC plugin. Result is similar to APCu, with total throughput of 29982 pageloads (not even 1% difference). I suspect the main difference is coming from the fact that we do not need to run the PHP processes at all. Page cache is taking care of complete page load. So, disabling the page cache confirms that throughput is at 376 pages. Using object cache in W3TC only did not help much either – giving 370 page loads with APC and 373 with xCache. So, here’s the result, which is strange, on the one hand, it used cache – 28079 times, while missed cache 2005 times, cache was cleared before test, so all the variables should have been initialized while doing test, but there’s only 68 variables, so not clear what 2005 misses are about. Beside, insert rate is equal to miss rate, which means, each second, it was doing 23 requests that did not have results, and was storing new variables in cache… only to check for them next second, I guess, al that to produce ~370 page loads. Using droping object cache for APCu, gives a bit different statistics, it stored twice the amount of variables, gets x20!!! times the hits, and has less misses – only 1667. It has twice less insert rate than miss rate.. and this produces 258 page loads… something is very wrong here as well. Checking xCache stats for the run does not explain much either. We get same amount of variables, hits and misses, as with APC bundled with w3tc. Using Supercache without any object caching gave 46746 pageloads, while using APC Object caching hardly changes it (after all, the pages were cached, so PHP was not used that much). Let’s complete this run of tests with using varnish. First let’s use it without any caching plugins. This results in 83984 page loads. The best result so far, 2 .8 times better than full page cache with APC and x2 better than SuperCache full page caching. Now, let’s try to combine two best approaches – WP Super Cache and Varnish. We get 82621 page loads, which is worse than Varnish alone. After all Varnish does not let WordPress to generate any pages, so it should not matter much if it gets cached before.